Double up for Boels-Dolmans in Tour of Flanders. 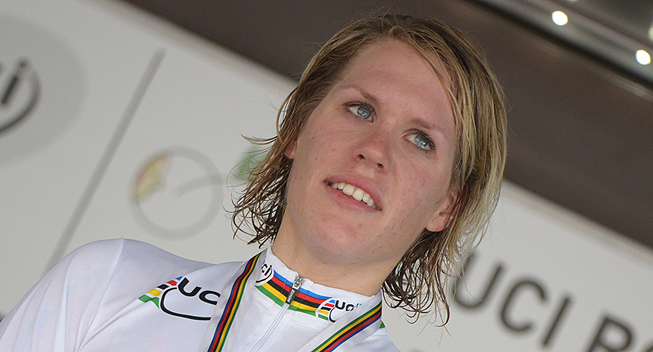 Ellen van Dijk won the Tour of Flanders after an impressive 25-kilometre solo. Her Boels-Dolmans teammate Lizzie Armistead sprinted to second place while Trofeo Binda winner Emma Johansson (Orica-AIS) came in third. Armitstead keeps the lead in the UCI Women Road World Cup overall classification. Under cloudy skies the crowds on the Oudenaarde market square saw the departure of 160 riders of 27 teams at 11am on Sunday morning. Though a few drops of rain started to fall, the remainder of the 139.6 kilometre race was ridden in dry conditions. The first hour of the race saw many crashes in the nervous 42 kilometre run towards the first of the ten climbs of the day. Orica-AIS’ Amanda Spratt and Rikke Lønne of Team Rytger were off to hospital and others like Lotto-Belisol’s Celine van Severen had to abandon. After 12 kilometres Gracie Elvin (Orica-AIS) and Valentina Carretta (Alé-Cipollini) broke clear of the peloton but their gap was never more than 25 seconds. Another attempt by Carretta and Lucinda Brand all stranded. The peloton kept close together until the final 26 kilometres of the race. Van Dijk quickly gained a lead of 12 seconds. Brand and Specialized-Lululemon’s Tiffany Cromwell counterattacked but were caught back on the Oude Kwaremont. With only one climb to go, the Paterberg, Van Dijk’s lead grew to 38 seconds. In the background her teammate Armitstead, Emma Johansson and Elisa Longo Borghini attacked but they were losing ground on Van Dijk. Ellen van Dijk crossed the line with an advantage of 1.01 minutes on Armitstead and Johansson. “Those last kilometres were really hard. I still can’t believe I did it. I wanted to win three races in my career: the world title, the Tour of Flanders and the Olympics. Now only one remains,” the winner smiled after the finish. Rabo-Liv left Oudenaarde with three UCI leader’s jerseys. Both Iris Slappendel and Pauline Ferrand-Prevot kept their respective sprint and best young rider jerseys. Teammate Anna van der Breggen now wears the mountain’s jersey after taking two points on the Leberg. Armitstead starts the Flèche Wallonne in the overall leader’s jersey with 320 points to her name.